Ah, here we are back again for another year of Dine Out where we find some restaurants who understand the concept and give us a real good menu at a reasonable price. This affords people the opportunity to check out many of the best spots in town without losing their whole paycheque. There are also special experiences that are worth a shot while some restaurants completely miss the boat and offer up a 3-course meal consisting of a beet salad, some entree that they would never offer on their regular menu and a pedestrian dessert. The whole point is for people to come back right? Well, after being invited to check out the Holy Crab's DOV menu, it looked promising since $40.00 gets you a 3-course seafood meal. The first course consisted of a choice of soups including the Seafood Bisque and Seafood Chowder. I was able to try both and was pleasantly surprised to find whole in-shell clams hidden within broth. Furthermore, there was tender baby shrimp as well. 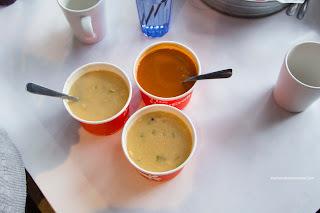 The bisque was silky and mild in flavour. I enjoyed how it wasn't salty while still emitting an aromatic brininess from the lobster shells. The chowder was pretty thick and buttery with bits of tender potato and the aforementioned seafood. 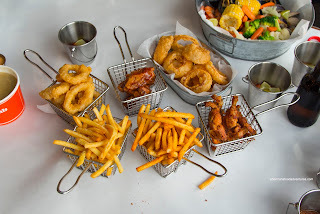 For our sides, we were given an option of Fries, Cajun Fries and Onion Rings. Unlike my first go around with the Holy Crab, the onion rings were much better this time being coated in a light and crispy tempura batter. The fries were crispy too and stayed as much even after our incessant picture taking. My preference was the Cajun fries as the extra spice eliminated the need for any dip. For a $2.00 surcharge, we could upgrade to either Calamari, Wings or Frog Legs. Although they looked more like onion rings, the calamari was quite good. Then large tender rings were coated in the same light tempura batter than was crispy and easy on the grease. The wings were pretty decent with rendered skin and moist meat. I thought the frog legs were also good being tender and almost juicy with a light fry on the outside. 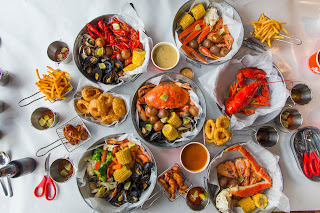 For our mains, one could choose their combo from either Snow Crab Legs, Shrimp, Potatoes and Corn or Crawfish, Clams, Mussels, Potatoes and Corn or Shrimp, Clams, Mussels, Steamed Veggies and Corn. 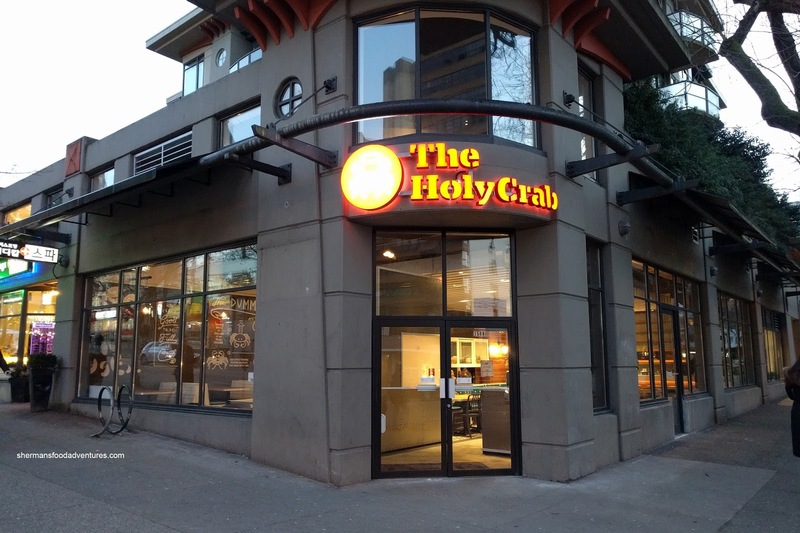 For a $10 surcharge, one could get King Crab Legs instead of snow crab or for $25 more, one could sub a whole Dungeness Crab for the snow crab legs. 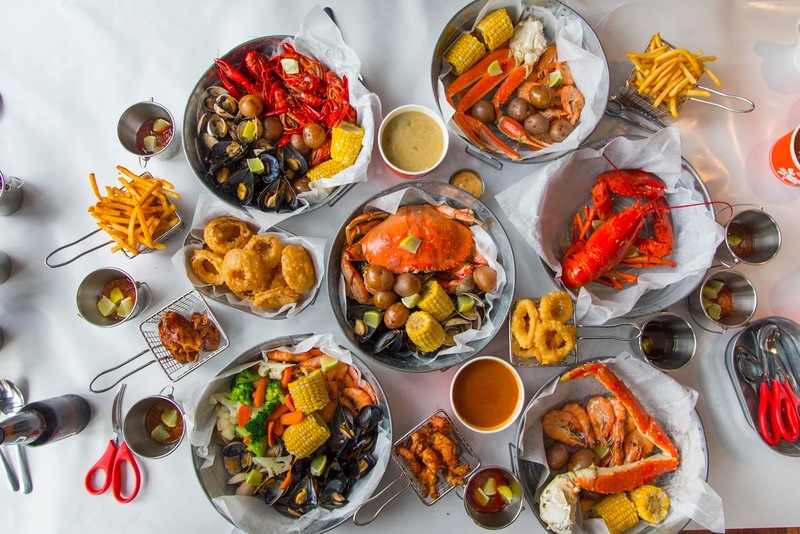 For the combo with the crawfish, one could sub Snow Crab Legs for $5 more or a Dungeness Crab for $30 more. Personally, I would chose the first option and be happy with that. I honestly couldn't finish all the food especially with the addition of corn and potatoes.